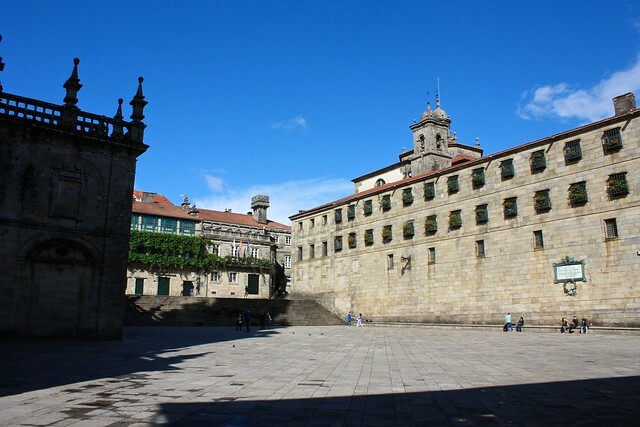 Santiago de Compostela, the capital of Spain’s northwesterly region of Galicia, is by no means a big city, barely reaching 100,000 on weekdays (and plummeting on weekends and school vacations when students go back home to mamá). Its monumental old town, while impressive, is often overshadowed by the cathedral’s west façade, and the ugly new town has buildings of perhaps ten floors at most. Because of this I put the word “skyline” in scare quotes in this post’s title. However, if you can manage to escape the tourist (and pilgrim) madness along Rúa do Franco south of the cathedral, you’ll likely find yourself in Santiago’s major public park, the Alameda. Walking north along the grand, tree-lined esplanade called the Paseo da Ferradura, you’ll eventually end up at a wide, semicircular mirador, or lookout point. From this strategic location you can take in the whole old town as it sprawls from north to south. You’ll notice that there is a lot more going on in Santiago’s zona vella than just the cathedral, though. What are all those other bell towers and domes doing there? It’s taken me a year of living here to finally figure out what tower belongs to which church, but in this post I’ve identified the four major churches that show up in the old town’s skyline that you can see to the west in the Alameda Park. 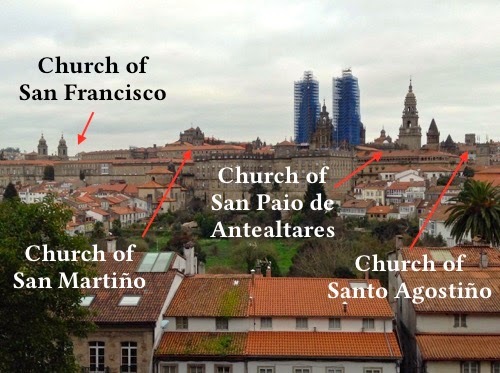 Founded by St. Francis of Assisi himself when he went on pilgrimage on the Camino de Santiago in 1214, the Church of San Francisco belongs to a community of Franciscan monks dating back 800 years. 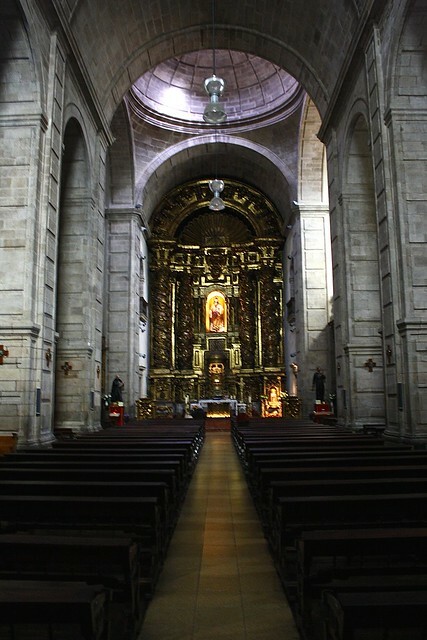 The present-day church, however, was built as recent as 1749: a clean, two-story, monumental Baroque sanctuary. It’s interesting that it’s oriented north-south instead of the traditional east-west layout, but because the main entrance faces south, a huge window at the main entrance lets warm sunlight pour in at all hours of the day—an important feature in often-gloomy Galicia. 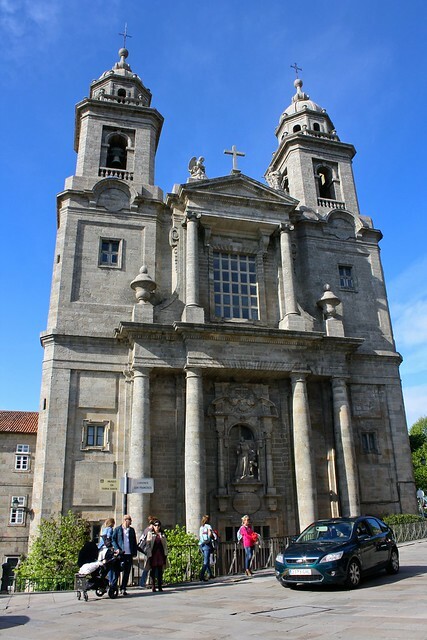 The bottom half of the church’s south façade was designed in the Baroque style, but the top half and the two bell towers are pure Neoclassicism. I actually went to a beautiful Easter Sunday Mass here this year…since the cathedral was standing-room-only outside in the plazas. Because Franciscan monks have historically been involved with Roman Catholic activity in the lands of modern-day Israel and Palestine, this church happens to manage a Holy Land Museum (Museo da Terra Santa) with artifacts stretching from prehistoric times to the present day as well as a huge, exquisite model of the Church of the Holy Sepulchre, carved from cypress wood from Gethsemane. The Franciscans also operate a fancy four-star hotel and an upscale restaurant, but their affordable café beneath the cloisters offers a warm and cozy atmosphere. The Church of San Martiño Pinario is attached to what was once Spain’s second-largest monastery but which today houses the Seminario Mayor (Catholic seminary for priests) and an hospedería or simple hotel for pilgrims and tourists alike. 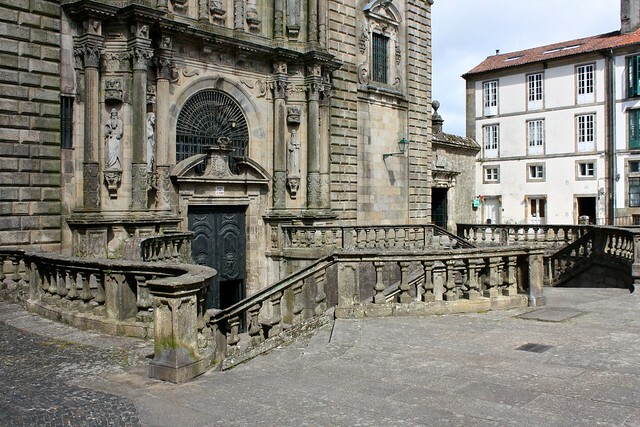 The south façade of the monastery, in Praza da Inmaculada across from the cathedral’s north doors, creates a stately atmosphere and is a fitting welcome for pilgrims walking their final steps on the Camino de Santiago. The church itself is really something else. It’s a bit of a walk to reach it from the monastery’s side of things, but once you get there you have to stop to take it all in. An ornamented Plateresque façade acts almost like an altarpiece for faithful Catholics, who must reach the below-ground-level west doors via a swirling double staircase that cuts into the plaza. The church functions today as the diocesan museum, but that hardly detracts from the heavenly interior that rivals the cathedral in beauty. 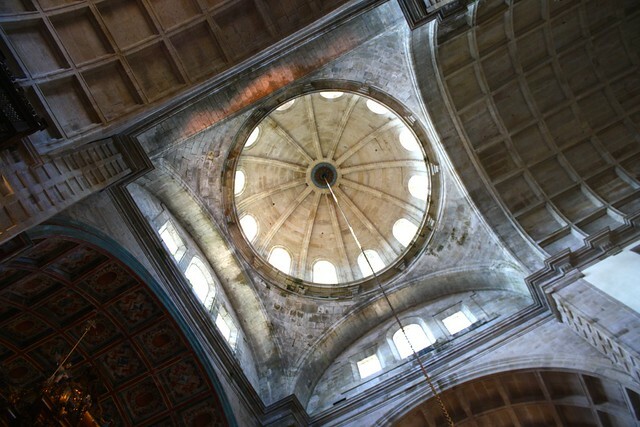 Soaring barrel vaults reach high and shed lots of light on an unbelievably-sized wooden altarpiece just dripping in gold. As part of the museum you can also go up to the balcony, where the cathedral’s Renaissance-era wooden choir stalls were moved in the 1950s. Accessible around the corner from the expansive Praza da Quintana, San Paio de Antealtares has been around nearly along as the cathedral itself. 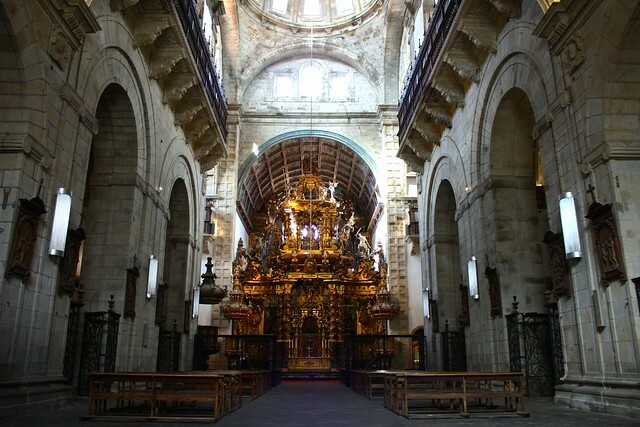 Founded as a community of Benedictine monks to look after the veneration of St. James (hence the name, “behind the altar”), in 1499 Benedictine nuns moved in and established what would become the most prestigious convent in Galicia. Forty nuns live here today, and you can even go up to their revolving door and purchase artisanal sweets like tarta de Santiago (almond cake), pastas de té (shortbread cookies), or almendrados (chewy almond cookies). 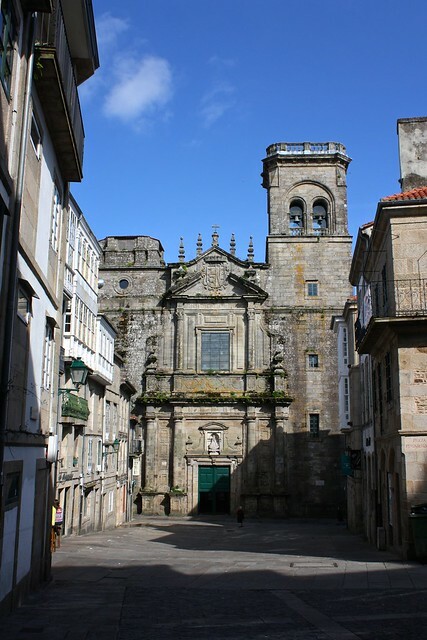 The church attached to the convent is laid out in a Greek cross plan, that is, all the “arms” of the interior space are the same length—rare in Galicia. An expansive dome with an oculus window at the top à la Parthenon rests stately upon pendentives which together create a grandiose atmosphere. The nuns also manage the Museum of Religious Art (Museo de Arte Sacro) that guards the original altar that would have been in the earliest basilicas dedicated to St. James. I like to think of this church as the “market church” since it stands directly north of Santiago’s famous mercado de abastos. In the mornings when the market is open, grandmas from the villages who don’t rent spots inside the market halls sit along the south side and the west entrance to the church peddling their just-pulled-from-the-ground potatoes, homemade wine and liqueurs, glistening greens, and flaky onions. The church’s bell tower is one of the most distinctive in the city—but the right tower was actually never completed and the left one was struck by lightning in 1788 and never rebuilt! 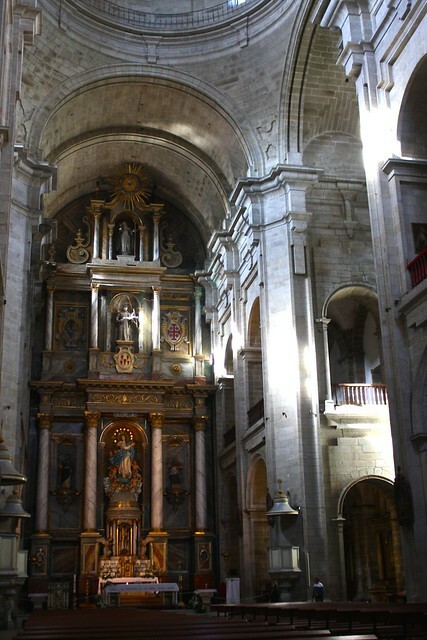 I don’t have much else to say about this church except that the inside is just the typical granite Baroque church you can find in Galicia with a gold-leaf wooden altarpiece. The church (and the attached monastery) were originally ministered to by Augustinian monks (hence the dedication to St. Augustine), but today Jesuits run a university dormitory in the building. 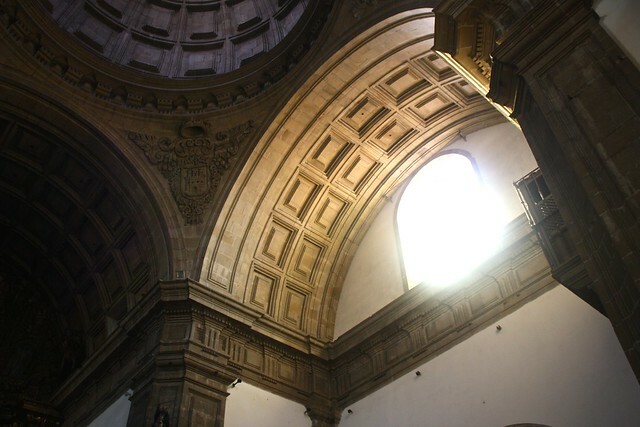 Which church would you be most interested in checking out if you visited Santiago? Tell me which one you liked the best below in the discussion thread!